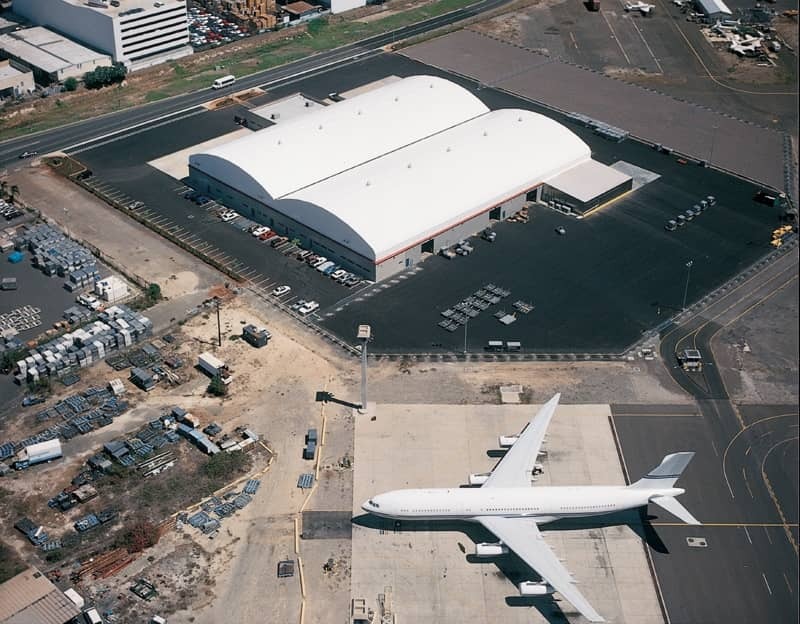 Built by Rubb Building Systems, Inc. at the Honolulu International Airport in Hawaii, the architectural structure covers a 70,000-square-foot area. Each of the two spans is 125 feet wide and 280 feet in length, with a wall height of 25 feet. The building, used to store cargo being shipped to and from Japan and the Mainland, is the largest of its kind in Honolulu. The lower walls of the building were fabricated with metal siding for added security, while Shelter-Rite architectural fabric was selected for the upper walls and roof. Strong enough to withstand the stresses of the huge structural spans, the fabric also has proven to withstand winds up to 90 mph and gusts up to 103 mph. A Kynar top finish on the fabric enhances its ability to resist the effects of long-term exposure to UV rays and damaging jet fuel fumes. For a long-term attractive appearance, the fluoropolymer finish on the PVC fabric will also shed dirt. In addition to helping hold down the actual cost of constructing the building, the white translucent fabric provides energy savings, letting in daylight and eliminating the need for artificial lighting during the day.